Find the leading brands in building supplies at Tiffin Supply. We carry the finest raw materials such as lumber, concrete, and metal. We also stock well-crafted doors, windows, and tile flooring, letting you complete your DIY project while saving money. Home appliances make daily chores and home improvement projects easy and quick. With our large selection of power tools and appliances, as well as electrical and plumbing supplies, you are sure to find exactly what you need for your DIY projects. 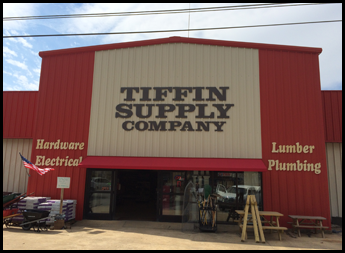 Make your next DIY building project a success with a little help from Tiffin Supply. Since 1941, our hardware store, conveniently located in Red Bay, Alabama, has sold building supplies to people like you. Whether you need premium lumber products, ceramic tiles, concrete blocks, or home appliances we carry it all and offer it at affordable prices. Now in our third generation, we continue to employ a knowledgeable sales staff, ready to assist you with whatever you need. We can select hard-to-find items, match paints, and special-order customized doors for you. At our store you get personalized service you won't find anywhere else.